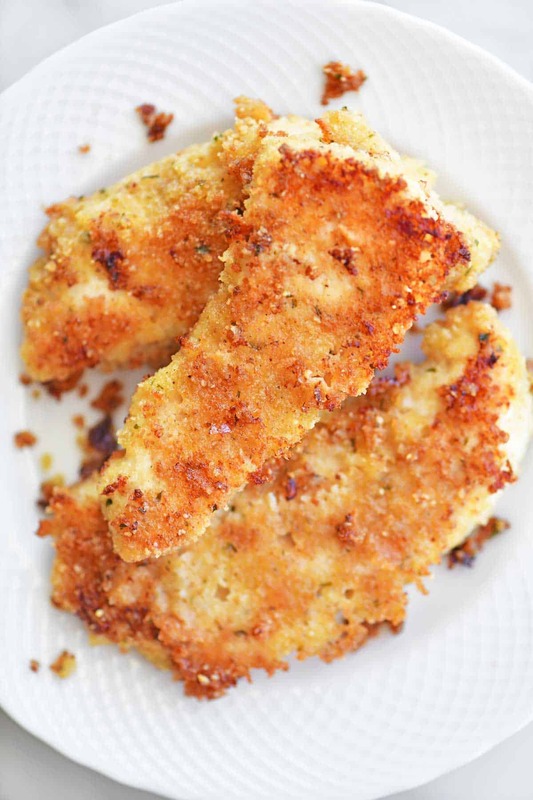 Garlic Parmesan Chicken Tenders are oven baked and so easy to make. They are crunchy and flavorful on the outside and tender and juicy on the inside. Skip the fast food and make these for dinner instead! Everyone loves chicken tenders but no one wants to be the one to stand around frying them! So make garlic parmesan chicken tenders in the oven instead. Oven baked chicken tenders are on our family menu at least once a month. Just cut chicken strips, coat the chicken and bake all the chicken tenders in one pan. 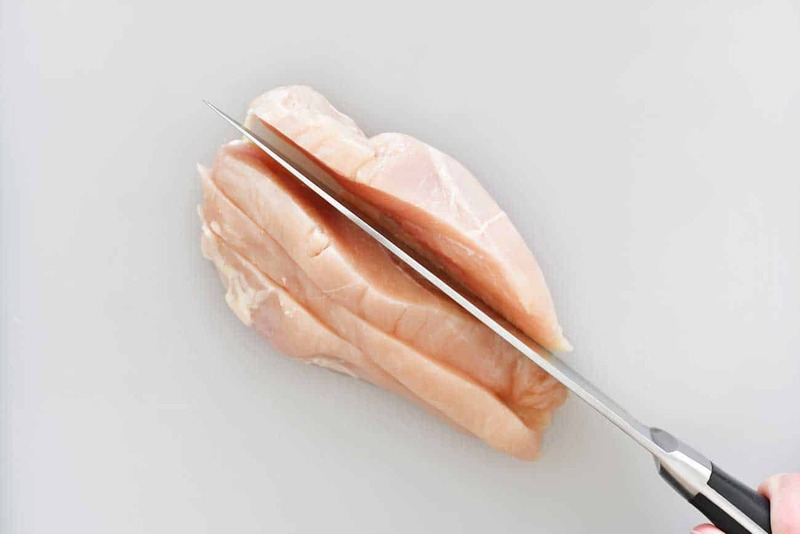 Cut boneless skinless chicken breasts into four strips. 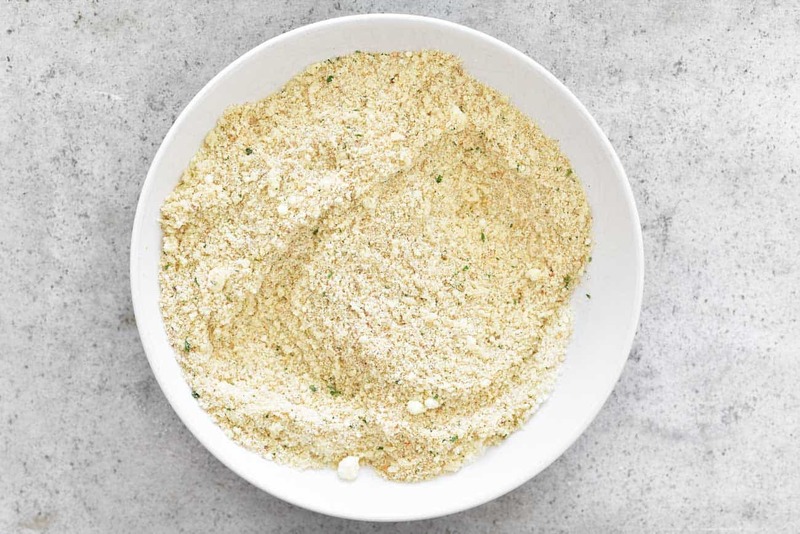 In a wide, shallow bowl mix together panko, Italian breadcrumbs, garlic powder, and grated Parmesan. Set aside. Melt butter in the microwave in a wide, shallow bowl. Dip the chicken tenders in the melted butter. 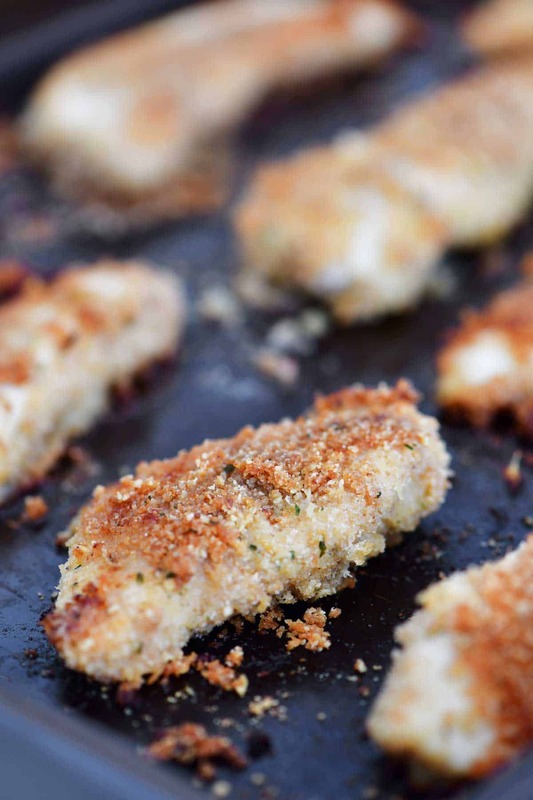 Place the coated chicken tenders on a large, rimmed baking sheet. Optional: Flip the chicken tenders over halfway through cooking to help brown both sides. If the chicken tenders are sticking, use a thin, metal spatula/turner to flip the chicken tenders (making sure to scrape up the coating along with the chicken). 1. How can I make these into garlic parmesan chicken nuggets? Cut the chicken breasts into nugget size instead of tenders and then follow the rest of the recipe. 2. Want more garlic? Add a teaspoon of garlic powder to the breadcrumbs mixture. 3. Do you have instructions for frying these chicken tenders? Follow steps 1-5 to cut and coat the chicken. Then, heat two tablespoons of oil in a large non-stick skillet over medium heat. Cook about 6 chicken tenders for 3-4 minutes per side until the fully cooked. Repeat the process with more oil and chicken tenders. Do not overcrowd the chicken in the pan or it won’t be able to get crispy. 4. How can I get my chicken tenders crispier? Try cooking the chicken tenders on a wire baking rack on top of the baking sheet if you are having issues with getting crispy tenders. 5. Any other tips for making the chicken tenders crispier? After cooking them, brown them under the broiler for a couple of minutes. 6. My chicken tenders stuck to the pan. Any tips? Allow them to cool a bit and then use a thin, metal spatula/turner to scrape the chicken tenders along with the breading off the pan. 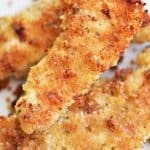 Lemon Pepper Chicken Tenders from the Gunny Sack: A 30 minute, kid-friendly recipe for crispy, baked, Lemon Pepper Chicken Tenders that are crunchy and flavorful on the outside and tender and juicy on the inside. Copycat Noodles and Company Parmesan Chicken and Buttered Noodles from The Gunny Sack: This recipe is a quick way to make one of your favorites at home! Key Lime Chicken Tenders from The Gunny Sack: These Key Lime Chicken Tenders have a crunchy coating, a light lime flavor and the chicken is tender and moist. 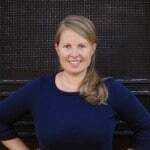 They’re my family’s favorite chicken recipe! 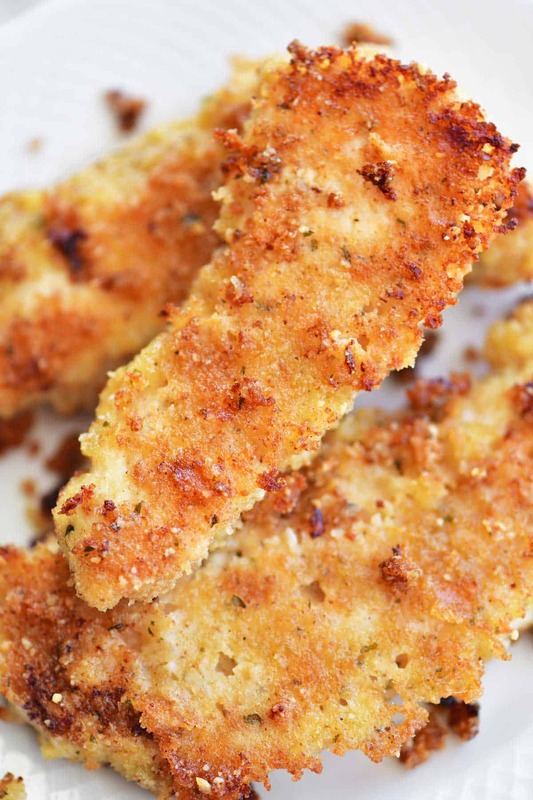 Garlic Parmesan Chicken Tenders are oven baked and so easy to make. They are crunchy and flavorful on the outside and tender and juicy on the inside. Cut the boneless skinless chicken breasts into four pieces. 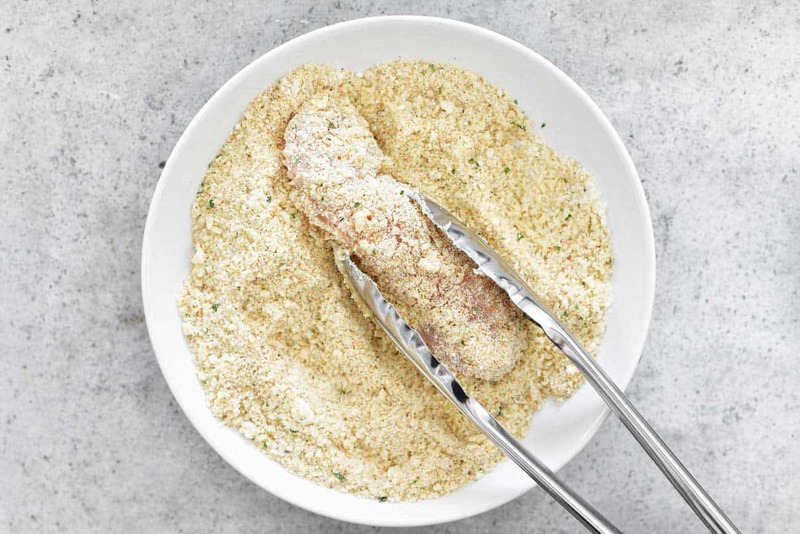 In a wide, shallow bowl mix together panko, Italian breadcrumbs, garlic powder and grated Parmesan. Set aside. Melt butter in the microwave in a wide, shallow bowl. 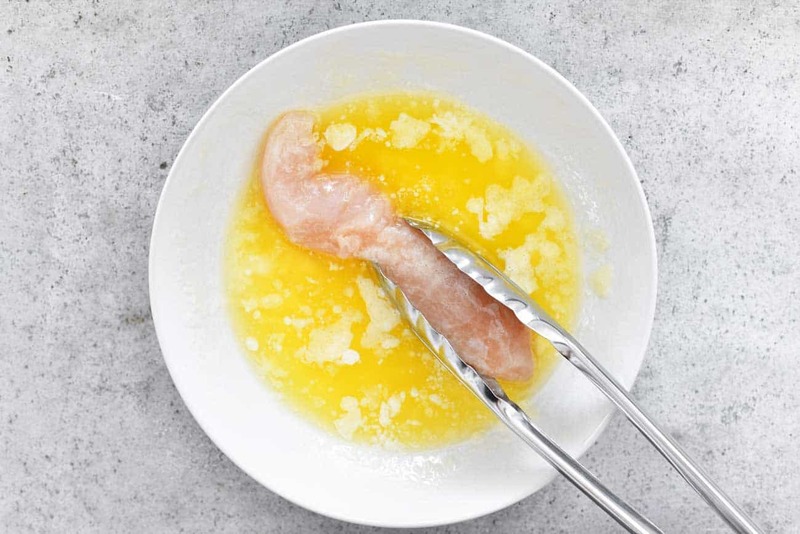 Dip the chicken tenders in the melted butter. OMG! 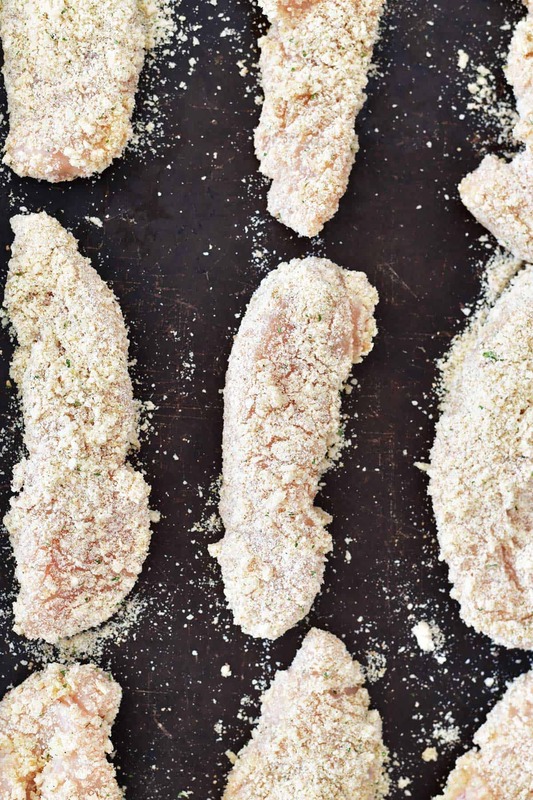 I saw this recipe this morning and I will never, ever fry chicken tenders again. I just made them for supper tonight and they are sooooo good! I have one of those non stick baskets with a pan that sits under it and used it rather than a cookie sheet. They browned all over and were so crispy outside and so tender and juicy inside. And the flavor? Excellent! Fry chicken tenders? Never again! Fabulous! Thanks for stopping back to let us know how it turned out. It continues to be one of my family’s favorite dinner recipes! I have not tried this recipe yet but I am fixing it tonight. I usually fry chicken tenders and although good, it is messy and I just hate the clean up. From your comments and the photos they look delicious! They are on the menu tonight! Tried this and it was wonderful. I added cheese stuffed ravioli with a tomato sauce. Made this tonight and my family LOVED IT!! My son said, “Mom, next time squeeze some lemon on it!” I think I will. Fabulous! We continue to make these a couple of times a month! Thank you so much for pointing that out! I totally missed that but I’ve updated the recipe now. Enjoy!